So you’ve stocked up your wardrobe with sarees, but have yet to figure out the perfect blouse? Take off a day and visit these fabric places – smart checks and stripes, funky prints, traditional khadi and handloom, you will find everything you are looking for. This place is any shopper’s paradise. With highly knowledgeable staff, picking material for your favorite new saree will be a breeze at either of their locations. 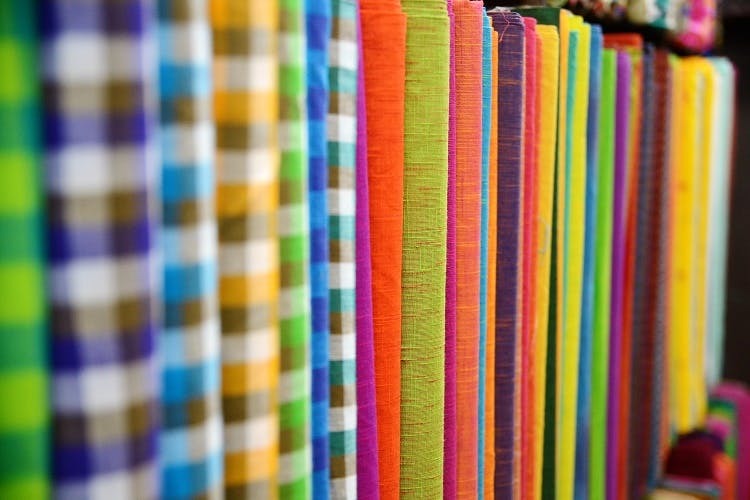 One of the oldest establishments near New Market, Vidhaata’s boasts of a wide range of fabric and colors. Their range of material ensures that there is a little something for everyone. Some of the sarees that you buy at Byloom come with attached fabric for a blouse, while those without the additional material, can be mixed and matched with the vast amounts of fabic and readymade blouses available at the store. Pick up a woven handloom cotton in bright colours, or mix and match your saree with one of their funky prints. This huge shop is a one-stop place for materials suitable for all your needs. From gorgeous indigo prints on mulmuls to chikankari and zardozis, they stock everything. They guarantee that their fabric will not run colour. Their printed fabrics make excellent blouses and should definitely find a spot in your closet! Finding parking might be tricky for this shop on the busy Theatre Road. This little gem of a store is tucked away in the heart of the city. While locating the shop might be tricky, you will find yourself completely overwhelmed by the sheer range of material available here. This store caters to everyone’s taste. This heaven of fabric is the one place you must visit if you’re looking for unique designs and colours in single and dual colour khadi, unusual stripes and checks, silks, kalamkaris and Mangalgiri cottons.